I designed a unique shade solution for our backyard oasis last year; and though it worked wonderfully, the stainless steel cable frayed and had to be replaced. I improved last year’s design by using slightly thicker cable, coated in vinyl. Also, rather than wrapping one long cable back and forth between the garage and shed, I cut each length of cable and attached it using carabiners and turnbuckles at the ends. The red lines in the drawing represent the cables running between the Garage (green) and the Shed (purple). Once I got the cables up and tightened, I reinstalled the solar twinkle lights as well. The shade cloth will have to wait until the stormy season has ended. 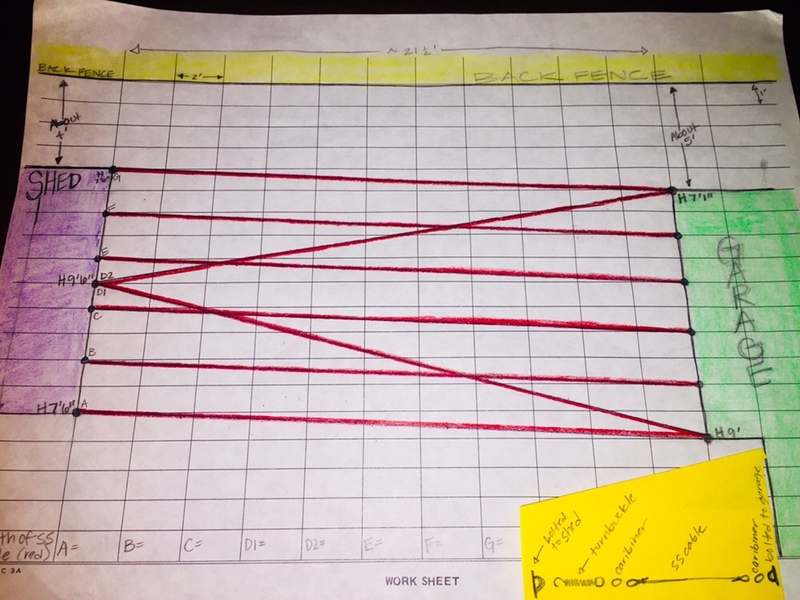 Today’s #OneGoodThing was using my color-coded drawing to install my new and improved cable design! I can’t wait to enjoy the lights and the shade with Mama! Day 77 of 365. And Day 808 in a row (here’s the first 366 & the following 365)! Clever lass, I think you like problem solving.